With Active Selling page, you can easily keep an eye on any questions you receive from buyers, open offers, bids/reserves met, your fixed-price sales, and the progress of your auctions. At the bottom of the left-hand column of links, you’ll see your Totals, which give you an idea of your sales during the past 31 days. eBay also shows the total items currently up for sale. The total dollar amount of the items that have been bid on appears with these totals. Depending on how you customize the view, you can see how many bids your auctions have, whether your reserves have been met, and how much time remains before the auction closes. By clicking an auction title, you can visit the auction to make sure your pictures are appearing or to check your bid counter. Don’t be frustrated if you don’t have a ton of bids. Many, many people watch auctions and don’t bid until the last minute, so you may not see a lot of bidding activity on your page when you drop in to look. 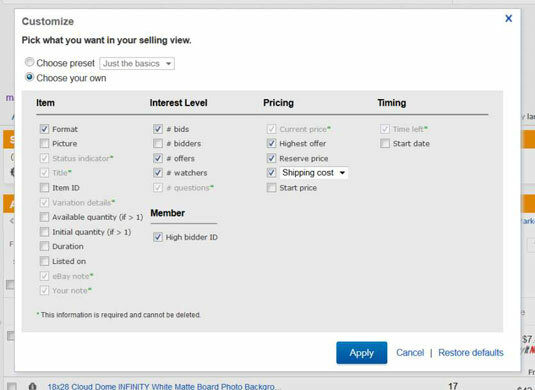 Be sure to customize your page and select the # of Watchers option so you can get a grip on how many people are interested in your item. 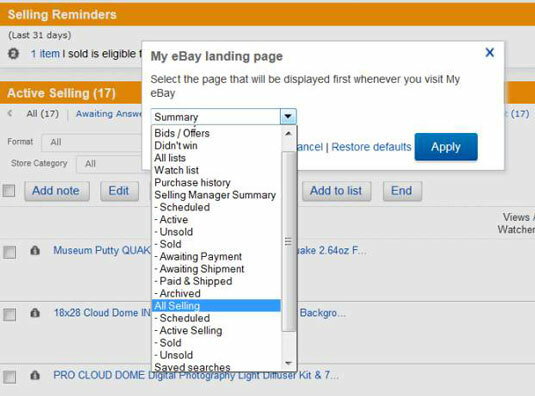 To customize what you see when you go to your my eBay page, just click the Change link that appears to the right of the words The my eBay landing page is set to XXXXX. Some users prefer the Summary page to show up first, and others prefer to see the All Selling page. It’s up to you. Click the Change link at the upper right to set your options. After you click it, you see the pop-up window with a drop-down list. By clicking the Edit drop-down menu at the upper right of any Selling view, you can preset what you’d like to see in the display, using the Customize options. All to see all your active listings. Awaiting Answer to view eBay Messages that are unanswered in your mailbox. Open Offers to find out when eBay members have made offers on fixed-price listings (those for which you say that you would entertain offers). Bids/Reserve Met to look at auctions where you’ve had some bidding activity. Without Bids/Reserve Not Met to see those auctions without bids or with bids that are too low. Sell Similar: List an item similar to the one on your page. Revise: Change a listing that has no bids. 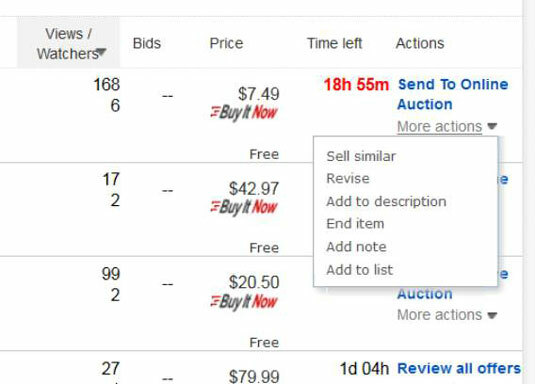 Add to Description: Add text to your listing’s description after the listing has bids. End Item: When the dog plays tug-of-war with your item, you can end the listing. Add note: If you want to add a notation (which only you can see and only on this page), select the check box to the left of the item title and then click the Add Note button at the top of the listings. Just type your comment on the page that appears and click Save. Add to List: If you want to make a list that contains some of your items, you can, and add them here. Auction prices that appear in green have received one or more bids (and met any reserves you’ve set). Auctions in red haven’t received any bids or the reserve price hasn’t been met.